Appointment and solemn public dedication to the office of judge and teacher of the Law and to all the functions associated therewith. The custom of ordination is a very ancient one; Joshua was ordained by Moses, who thereby indicated him as his successor (Num. xxvii. 22-23). The ceremony was as follows: Moses placed Joshua before the priest Eleazar and the congregation and laid his hands upon him while giving him instructions. A portion of Moses' spirit was transferred to Joshua through Moses' hands (comp. ib. verse 20, and Deut. xxxiv. 9). Moses ordained also the seventy elders who assisted him in governing the people (Num. xi. 16-17, 24-25). It is not expressly stated that the elders were ordained by laying on of hands; it is merely said that some of Moses' spirit was imparted to the elders. This transference of the spirit, however, could take place only by laying on of hands, as appears from the passage Deut. xxxiv. 9. Maimonides says that Moses ordained the elders in the same way as he ordained Joshua, ("Yad," Sanhedrin, iv. 1). The laying on of hands is mentioned nowhere else in the books of the Old Testament. According to tradition the elders ordained by Moses ordained their successors, who in turn ordained others, so that there existed an unbroken series of ordainers and ordained from Moses down to the time of the second Temple ("Yad," l.c.). During the time of the second Temple the custom of ordination grew into a regular institution. The various members of the Sanhedrin were dedicated to their office by ordination. This ceremony was considered an especially important one in the latter part of the rule of Alexander Jannæus, when it became desirable to prevent Sadducees from becoming members of the Sanhedrin. At that time only those were admitted to membership in the Sanhedrin who had been dedicated by ordination. Persons so ordained bore the title of "zaḳen" (elder; Sanh. 14a), like the seventy "elders" of Moses (Num. xi. 16). Three rows of scholars always sat before the Sanhedrin, and whenever it became necessary to choose a new member a scholar from the first row was chosen and ordained. Ordination was necessary not only to membership in the Great Sanhedrin, but also to membership in the smaller sanhedrins and in any regular college of judges empowered to decide legal cases. It was decreed at the time of Judah ha-Nasi that any religio-legal decision, including decisions relating to the ceremonial law, could be handed down only by those properly authorized (Sanh. 5b). The manner of ordination and the person performingthe ceremony varied at different times. Originally it was customary for each teacher to ordain his own pupils (Yer. Sanh. 19a). The relation between Moses and Joshua was regarded as the prototype of this relation between teacher and pupil. As Joshua was ordained by the hands of Moses resting upon him, so, probably, every pupil was ordained by the hands of his own teacher. The ceremony of ordination derives its name, "semikah," from the custom of the laying on of hands (Tosef., Sanh. i. 1; Ket. 112a). The manner of ordination was subsequently changed, and instead of the laying on of hands the custom was introduced of dedicating the candidate by pronouncing his name. This change seems to be connected with another change, when only the patriarch was empowered to perform the ceremony. Yer. Sanh. 19a says that the original custom for every teacher to ordain his own pupil was abolished, it being decided, as a mark of honor to the patriarchal house, that any ordination performed by the college without the consent of the patriarch was invalid, while the patriarch received the privilege of performing the ceremony without the consent of the college. This occurred after the Bar Kokba war, when affairs in Palestine were in general reorganized, and on the cessation of the Hadrianic persecution, during which ordination was strictly forbidden ('Ab. Zarah 8b; Sanh. 13b-14a). Simeon b. Gamaliel was the first to receive the privilege of ordaining as an honorary function (comp. Grätz, "Gesch." 3d ed., iv. 453). When the ceremony of ordination became an official prerogative of the Patriarch, the custom of laying on of hands, which had a meaning only where the teacher ordained a pupil, as Moses had ordained Joshua, lost its signification and was abolished. 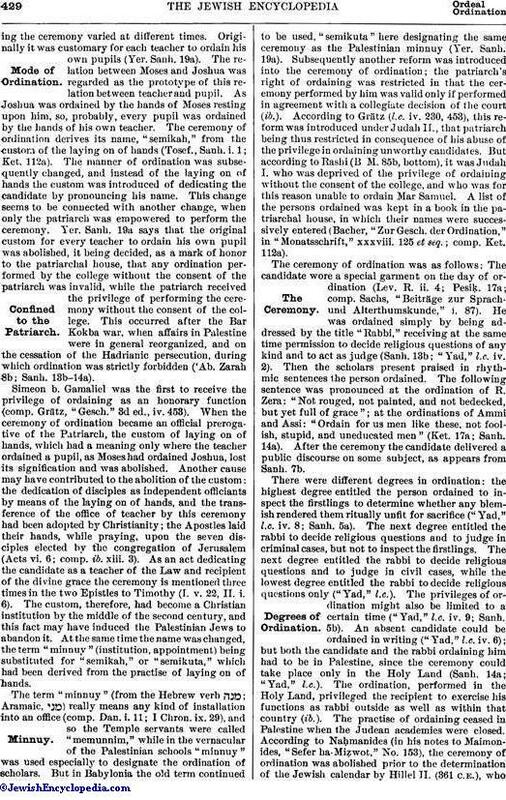 Another cause may have contributed to the abolition of the custom: the dedication of disciples as independent officiants by means of the laying on of hands, and the transference of the office of teacher by this ceremony had been adopted by Christianity; the Apostles laid their hands, while praying, upon the seven disciples elected by the congregation of Jerusalem (Acts vi. 6; comp. ib. xiii. 3). As an act dedicating the candidate as a teacher of the Law and recipient of the divine grace the ceremony is mentioned three times in the two Epistles to Timothy (I. v. 22, II. i. 6). The custom, therefore, had become a Christian institution by the middle of the second century, and this fact may have induced the Palestinian Jews to abandon it. At the same time the name was changed, the term "minnuy" (institution, appointment) being substituted for "semikah," or "semikuta," which had been derived from the practise of laying on of hands. The term "minnuy" (from the Hebrew verb ; Aramaic, ) really means any kind of installation into an office (comp. Dan. i. 11; I Chron. ix. 29), and so the Temple servants were called "memunnim," while in the vernacular of the Palestinian schools "minnuy" was used especially to designate the ordination of scholars. But in Babylonia the old term continued to be used, "semikuta" here designating the same ceremony as the Palestinian minnuy (Yer. Sanh. 19a). Subsequently another reform was introduced into the ceremony of ordination; the patriarch's right of ordaining was restricted in that the ceremony performed by him was valid only if performed in agreement with a collegiate decision of the court (ib.). According to Grätz (l.c. iv. 230, 453), this reform was introduced under Judah II., that patriarch being thus restricted in consequence of his abuse of the privilege in ordaining unworthy candidates. But according to Rashi (B. M. 85b, bottom), it was Judah I. who was deprived of the privilege of ordaining without the consent of the college, and who was for this reason unable to ordain Mar Samuel. A list of the persons ordained was kept in a book in the patriarchal house, in which their names were successively entered (Bacher, "Zur Gesch. der Ordination," in "Monatsschrift," xxxviii. 125 et seq. ; comp. Ket. 112a). The ceremony of ordination was as follows: The candidate wore a special garment on the day of ordination (Lev. R. ii. 4; Pesiḳ. 17a; comp. Sachs, "Beiträge zur Sprach- und Alterthumskunde," i. 87). He was ordained simply by being addressed by the title "Rabbi," receiving at the same time permission to decide religious questions of any kind and to act as judge (Sanh. 13b; "Yad," l.c. iv. 2). Then the scholars present praised in rhythmic sentences the person ordained. The following sentence was pronounced at the ordination of R. Zera: "Not rouged, not painted, and not bedecked, but yet full of grace"; at the ordinations of Ammi and Assi: "Ordain for us men like these, not foolish, stupid, and uneducated men" (Ket. 17a; Sanh. 14a). After the ceremony the candidate delivered a public discourse on some subject, as appears from Sanh. 7b. There were different degrees in ordination: the highest degree entitled the person ordained to inspect the firstlings to determine whether any blemish rendered them ritually unfit for sacrifice ("Yad," l.c. iv. 8; Sanh. 5a). The next degree entitled the rabbi to decide religious questions and to judge in criminal cases, but not to inspect the firstlings. The next degree entitled the rabbi to decide religious questions and to judge in civil cases, while the lowest degree entitled the rabbi to decide religious questions only ("Yad," l.c.). The privileges of ordination might also be limited to a certain time ("Yad," l.c. iv. 9; Sanh. 5b). An absent candidate could be ordained in writing ("Yad," l.c. iv. 6); but both the candidate and the rabbi ordaining him had to be in Palestine, since the ceremony could take place only in the Holy Land (Sanh. 14a; "Yad," l.c.). The ordination, performed in the Holy Land, privileged the recipient to exercise his functions as rabbi outside as well as within that country (ib.). The practise of ordaining ceased in Palestine when the Judean academies were closed. According to Naḥmanides (in his notes to Maimonides, "Sefer ha-Miẓwot," No. 153), the ceremony of ordination was abolished prior to the determination of the Jewish calendar by Hillel II. (361 C.E. ), whowas induced thereby to undertake that work. For after it had been abolished there would soon have been no college entitled to determine the calendar, and hence later generations would have been without an authoritative mode of reckoning. In 1538 the ceremony of ordination was for a short time restored in Palestine by Jacob Berab. 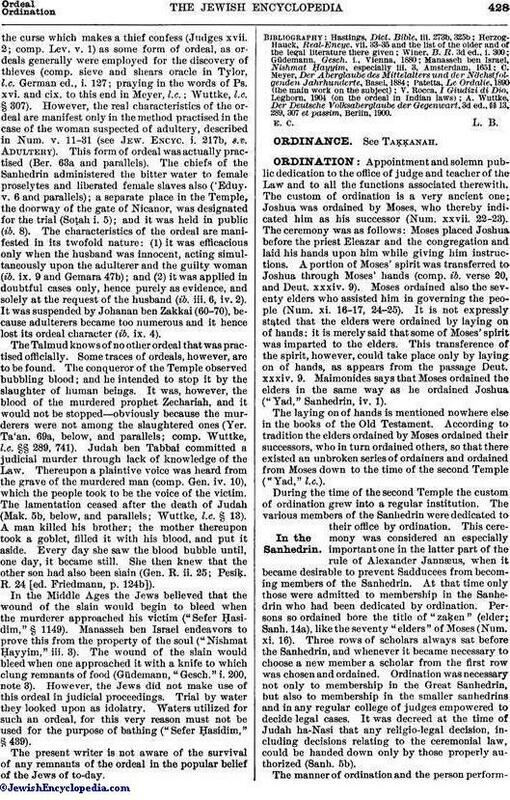 He justified his action by the statement of Maimonides (l.c. iv. 11) that if the wise men of Palestine agree to ordain one of their number they are entitled to do so, and that the person so ordained is privileged to ordain others. As Safed was at that time the largest community in Palestine, the Talmudists there were in a position to reintroduce the Sanhedrinic dignity. Twenty-five officiating and non-officiating rabbis convened at the instance of Berab, whom they ordained as chief rabbi. In a discourse Berab established the legality of this step upon Talmudic principles and refuted all possible objections to it. Thereupon various Palestinian Talmudists in the other communities gave their consent to the innovation. Berab then undertook to restore the Sanhedrin, ordaining four other rabbis and Talmudists, including Joseph Caro and Moses di Trani. But as Berab had neglected to obtain the consent of the rabbinical college of Jerusalem, the latter felt slighted. 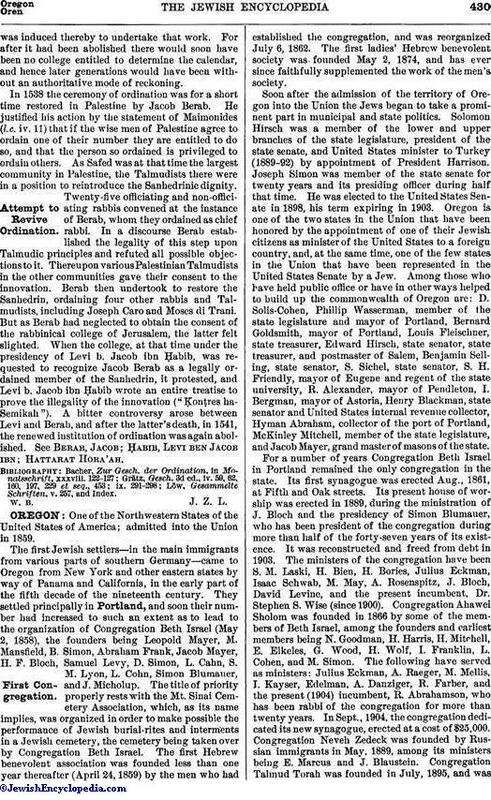 When the college, at that time under the presidency of Levi b. Jacob ibn Ḥabib, was requested to recognize Jacob Berab as a legally ordained member of the Sanhedrin, it protested, and Levi b. Jacob ibn Ḥabib wrote an entire treatise to prove the illegality of the innovation ("Ḳonṭres ha-Semikah"). A bitter controversy arose between Levi and Berab, and after the latter's death, in 1541, the renewed institution of ordination was again abolished. See Berab, Jacob; Ḥabib, Levi ben Jacob ibn; Hattarat Hora'ah. Löw, Gesammelte Schriften, v. 257, and Index.